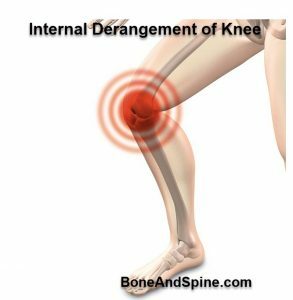 Internal derangement of knee is a term used for a group of disorders involving disruption of the normal functioning of the ligaments or cartilages or menisci of the knee joint. It must be stressed that it is a vague term and its use is reducing in orthopedic practice and literature. The term was more common when the diagnostic workup was limited and conditions of similar symptoms were clubbed together. Thus, there is an internal damage to the resulting in certain disorders of joint including torn meniscus, loose bodies in the knee and damaged ligaments. Internal derangement of the knee does not include chronic disorders such as osteoarthritis of the knee, chondromalacia patellae, discoid meniscus, and meniscal cysts. There is often a preceding acute event resulting in soft tissue injury to knee structures. The knee is the largest joint in the body. It is a synovial hinge type of a joint. Femur, tibia, patella, and fibula are articulating bones. The primary articulation is between Condyles of femur & tibia. Patella is a sesamoid bone present anteriorly and articulates with femoral condyle. Anterior & posterior cruciate ligaments are two major ligaments of the knee. Medial & lateral collateral ligaments stabilize knee sideways motion. The patellar tendon connects the lower part of the patella with the upper part of the tibia. Two menisci in each act as shock absorbers & help in spreading the weight. Physical trauma is the major cause of internal derangement of the knee, sports injury being the commonest form of trauma. Road traffic accident or an occupational stress are other forms of trauma responsible for this injury. Actions causing an excessive torque on the knee joint- twisting, rapid deceleration, or landing from a jump. When all three present, it is called O’Donahue or unhappy triad. Neutral position- lateral collateral ligament injury, iliotibial band, and/or the biceps femoris. Extended and internally rotated knee Lateral collateral, anterior collateral. Posterior collateral and lateral posterior capsule may be injured. Avulsion of the tibial tuberosity. In acute cases, there would be a history of a snapping or tearing sensation at the time of the injury. There could be marked swelling which indicates bleeding into the joint. There would be an immediate sense of instability. In chronic derangement of the knee, the main symptoms are pain and instability. Often there would be a history of trauma. The patient may complain of instability, effusion, pain, and locking of the knee. If possible, observe the patient standing and/or walking. During the local examination, the knee may be compared to the opposite side for better assessment. Examine the uninjured knee first to approximate baseline values. The wasting of the thigh mass [can be compared by measuring girth] may indicate a chronic problem. The examination may reveal effusion of the knee. Ballottement indicates the underlying knee effusion. To check ballottement, place one hand superior to the patella and compress the tissues (and possibly fluid) inferiorly. With other hand push the patella toward knee [posteriorly directed force]. In a normal knee without effusion, the patella moves directly onto the femoral condyle. Normally the patella should move approximately 1 mm, in the presence of joint swelling the anterior to the posterior motion will be increased as the effusion pushes the patella further off the femur. Therefore the there would be an increased motion of patella as it travels more distance on pushing it and the examiner would have a spongy feel. A superior patella than usual or patella alta could indicate a disruption of the patellar ligament. A lower patella [patella baja] may indicate rupture of the quadriceps tendon might cause an inferior position of the patella. For palpation, bring the knee in slight flexion by placing a pillow under the popliteal fossa. Joint line tenderness indicates a meniscal tear. The ligaments should be palpated for any tenderness. It refers to point tenderness along the medial aspect of the joint line which increases with internal rotation and extension of the tibia. Indicates medial meniscus tear. With the patient supine and the hip and knee flexed to 90° the examiner vigorously and quickly rotates the tibia internally and externally. Pain in the lateral compartment with forced internal rotation indicates a lateral meniscus lesion. Similarly, pain in the medial-compartment during forced external rotation indicates a lesion of the medial meniscus. This is done when the tenderness is most pronounced along the anterior joint line. When the knee is moved from extension into flexion by the examiner, the meniscus is displaced posteriorly, and the point of tenderness is displaced from the anterior joint line back towards the collateral ligaments. This test can differentiate meniscal injuries from ligamentous problems, as ligament pain does not shift with flexion. The patient sits cross-legged. Pressure is exerted along the medial aspect of the knee. Medial knee pain indicates a posterior horn lesion of the medial meniscus. A positive patellar apprehension sign implies a preceding patellar dislocation. With the leg held and supported in 30° of flexion, apply a firm, laterally directed force toward the medial aspect of the patella. Apprehension or alarm on the patient’s part, such as grabbing for the examiner’s arm when pressure is applied is considered positive. Evaluate the knee for range of motion. Support and stabilize the patient’s thigh just above the patella with one hand. With the other hand, hold the limb below the knee and try bringing the proximal tibia forward. In case of a large thigh, position it over the knee of the examiner and stabilize it by putting downward pressure. With the other hand, grasp the proximal tibia and attempt to move it anteriorly. An excessive forward motion of the tibia without a firm end point indicates anterior cruciate ligament injury. Place the patient in the supine position, flex the hip to 45°, and bend the knee to 90° and keep the foot planted firmly on the examination table. Sitting on the dorsum of the foot, place both hands behind the knee and try to displace the proximal leg anteriorly. An excessive movement with a soft endpoint indicates a positive test. The anterior drawer test is less sensitive for ACL damage than the Lachman. It is done in a similar manner to anterior drawer testing, except that the pressure is directed backward on the proximal tibia. Posterior instability arising from PCL injury manifests as an abnormal increase in posterior tibial translation. Flex the patient’s hips and knees to 90° while supporting the patient’s heels. A deficient posterior cruciate ligament would cause a tibial sag posteriorly. With the patient supine, the knee to be tested is fully extended and the hip flexed to approximately 30 degrees. One hand holds the heel of the foot of the leg to be tested. The examiner’s other hand is on the lateral aspect of the proximal tibia. From the starting position, the examiner holds the lower leg in internal rotation and slowly flexes the knee while putting a moderate valgus and internal rotation force on the proximal tibia. This test is considered positive if the proximal tibia subluxes anteriorly on the distal femur at about 30 degrees of flexion. The proximal tibia will clunk back into place while returning the knee to an extension. Flexion past approximately 40 degrees will also reduce the tibia due to the iliotibial band. With the patient supine and the knee in maximum flexion, palpate the posteromedial margin of the affected knee joint with one hand and support the foot with the opposite hand. Externally rotate the lower leg as far as possible, apply varus pressure, and cautiously extend the knee joint. An audible, palpable, and painful clunk indicate medial meniscus tear. To check the lateral meniscus, the hand is over the posterolateral aspect of the knee and internally rotate the lower leg to its maximum extent. Slowly extend the leg again, listening and feeling for a click or pop. With the patient in the prone position, flex the knee to 90°. Stabilize the patient’s thigh against the examination table with the knee of the examiner, and apply a downward-directed force onto the patient’s foot and leg. Rotate the leg while mildly flexing and extending the knee joint. Now repeat the test with the distraction of knee instead of the compression. If the rotation plus compression is more painful or shows decreased rotation relative to the normal side, the lesion is most likely to be a meniscus injury. If it is true in distraction, the cause is most likely ligamentous. The patient stands first on the good leg, and then on the symptomatic leg, with the knee in 5 degrees of flexion and again with the knee in 20 degrees of flexion. Next, the patient rotates the body internally and externally 3 times, and the test is considered positive if there is joint line discomfort and/or a sense of locking or catching. The patient assumes a squatting position with the lower extremities held in maximum external rotation [to detect a medial meniscal tear] and repeat in the maximum internal rotation (to detect a lateral meniscal tear). Pain and/or an audible click are positive findings. For issue related to previous trauma, lab works are mostly not required. For surgical patients, the relevant test may be undertaken. A CBC count, erythrocyte sedimentation rate (ESR), and serum glucose and uric acid levels should also be considered at the time of arthrocentesis if infectious or gouty arthritis is a consideration. Plain images of the knee generally include anteroposterior and lateral views at the minimum. Avulsion fractures of the tibial spine or the femoral condyles imply ligamentous rupture. Old medial collateral ligament damage may show calcification on x-ray [Pellegrini-Stieda syndrome]. Patellar abnormalities like a bipartite patella may be present. MRI is able to provide greater tissue details. Ultrasonography simplifies differentiation of a Baker cyst, popliteal artery aneurysm, and thrombophlebitis, and it has also been used to diagnose tendon ruptures. In substantial effusion, knee aspiration may be considered. Treatment for internal derangement of knee depends on the nature and the severity of the injury, age and health status of the patient. o Drugs for pain and inflammation. o Physical therapy and mild less strenuous exercises. In case of severe internal derangement of the knee, surgery might be required. The type of surgery would depend on the type of the lesion.